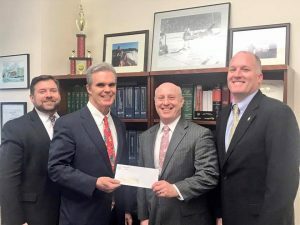 Pictured with (from left) ADA John O’Leary, Chief of Investigations of the IFB Anthony M. DiPaolo, and Investigative Manager Michael Cantwell. I’m proud to be continuing our partnership with the Insurance Fraud Bureau and thank them for their annual grant to help us fund investigations and prosecutions of insurance fraud in Worcester County. Working to eliminate insurance fraud is an effort that helps reduce automobile insurance premiums for all drivers.